Guinea-Bissau (/ˌɡɪni bɪˈsaʊ/ ( listen)), officially the Republic of Guinea-Bissau (Portuguese: República da Guiné-Bissau [ʁeˈpublikɐ dɐ ɡiˈnɛ biˈsaw]), is a country in West Africa that covers 36,125 square kilometres (13,948 sq mi) with an estimated population of 1,815,698. Independence was unilaterally declared on 24 September 1973. Recognition became universal following 25 April 1974 socialist-inspired military coup in Portugal, which overthrew Lisbon's Estado Novo regime. Guinea-Bissau is a founding member state of the Community of Portuguese Language Countries (CPLP), also known as the Lusophone Commonwealth, and international organization and political association of Lusophone nations across four continents, where Portuguese is an official language. 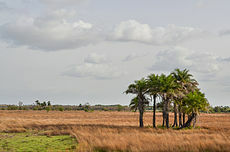 The remaining rural population speaks a variety of native African languages unique to each ethnicity: Fula (16%), Balanta (14%), Mandinga (7%), Manjaco (5%), Papel (3%), Felupe (1%), Beafada (0.7%), Bijagó (0.3%) and Nalu (0.1%), which form the ethnic African languages spoken by the population. 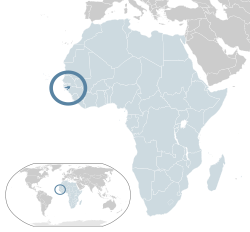 Most Portuguese and Mestiços speakers also have one of the African languages and Kriol as additional languages. Ethnic African languages are not discouraged, in any situation, despite their lower prestige. These languages are the link between individuals of the same ethnic background and daily used in villages, between neighbors or friends, traditional and religious ceremonies, and also used in contact between the urban and rural populations. However, none of these languages are dominant in Guinea-Bissau. French is taught as a foreign language in schools because Guinea-Bissau is surrounded by French-speaking nations. Guinea-Bissau is a full member of the Francophonie. Other estimates claim that Christianity is not the dominant religion as there are 45% Muslims, 31% Animists and 22% Christians. However, according to Worldatlas Christianity is considered to be growing in the country, especially among the followers of traditional religions. The cabasa is the primary musical instrument of Guinea-Bissau, and is used in extremely swift and rhythmically complex dance music. Lyrics are almost always in Guinea-Bissau Creole, a Portuguese-based creole language, and are often humorous and topical, revolving around current events and controversies. ^ "Guinea-Bissau" – Field Listing: Nationality. Archived 26 June 2015 at the Wayback Machine The World Factbook 2013–14. Washington, DC: Central Intelligence Agency, 2013. Retrieved 15 July 2015. 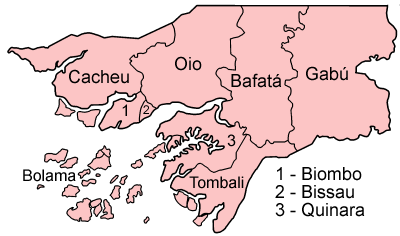 ^ a b c d "Guinea-Bissau". International Monetary Fund. Archived from the original on 11 November 2018. Retrieved 18 October 2018. ^ "2016 Human Development Report Summary" (PDF). United Nations Development Programme. 2016. pp. 21–25. Archived (PDF) from the original on 18 July 2017. Retrieved 21 March 2017. ^ Empire of Kaabu, West Africa Archived 30 June 2013 at the Wayback Machine. Access Gambia. Retrieved 22 June 2013. ^ Alvise Cadamosto Archived 18 October 2012 at the Wayback Machine. Nndb.com. Retrieved 22 June 2013. ^ Eustache De La Fosse (1992). Voyage d'Eustache Delafosse sur la côte de Guinée, au Portugal et en Espagne: 1479–1481. éditions Chandeigne. ISBN 978-2-906462-03-8. Archived from the original on 2 January 2014. Retrieved 19 December 2012. 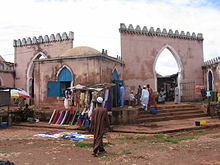 ^ a b "A Brief History of Guinea-Bissau – Part 1" Archived 5 January 2013 at the Wayback Machine. Africanhistory, US Department of State, at About.com. Retrieved 22 June 2013. ^ Amilcar Cabral 1966 "The Weapon of Theory" Archived 16 October 2012 at the Wayback Machine. Address delivered to the first Tricontinental Conference of the Peoples of Asia, Africa and Latin America held in Havana in January 1966. Marxists.org. Retrieved 22 June 2013. ^ The PAIC Programme Appendix Archived 30 January 2013 at the Wayback Machine. Marxists.org. Retrieved 22 June 2013. ^ El Tahri, Jihan (2007). Cuba! Africa! Revolution!. BBC Television. Event occurs at 50:00–60:00. Archived from the original on 10 December 2016. Retrieved 2 May 2007. ^ Brittain, Victoria (17 January 2011). "Africa: a continent drenched in the blood of revolutionary heroes". The Guardian. London. Archived from the original on 17 January 2017. Retrieved 14 December 2016. ^ Guiné-Bissau: Morreu Luís Cabral, primeiro presidente do país Archived 3 May 2014 at the Wayback Machine. Expresso.sapo.pt (30 May 2009). Retrieved 22 June 2013. ^ Guinea-Bissau's Kumba Yala: from crisis to crisis Archived 16 July 2012 at the Wayback Machine. Afrol.com. Retrieved 22 June 2013. ^ GUINEA-BISSAU: Vieira officially declared president Archived 25 August 2012 at the Wayback Machine. irinnews.org (10 August 2005). ^ "Army man wins G Bissau election". London: BBC News. 28 July 2005. Archived from the original on 27 June 2006. Retrieved 5 January 2010. ^ Balde, Assimo (24 November 2008). "Coup attempt fails in Guinea-Bissau". London: The Independent UK independent.co.uk. Archived from the original on 15 May 2011. Retrieved 28 June 2010. ^ "Soldiers kill fleeing President". Archived from the original on 8 March 2009. Retrieved 2 March 2009. CS1 maint: BOT: original-url status unknown (link). 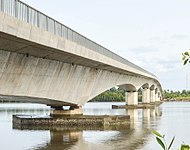 news.com.au (2 March 2009). ^ Elections, Guinea-Bissau (27 May 2009). "On the Radio Waves in Guinea-Bissau". swisspeace. Archived from the original on 8 December 2009. Retrieved 7 February 2010. ^ "Já foi escolhida a data para a realização das eleições presidenciais entecipadas". Bissaudigital.com. 1 April 2009. Archived from the original on 21 January 2012. Retrieved 26 June 2010. ^ "Tiny Guinea-Bissau becomes latest West African nation hit by coup". Bissau. 12 April 2012. Archived from the original on 13 April 2012. Retrieved 14 April 2012. ^ "Guinea-Bissau opposition vows to reach deal with junta | Radio Netherlands Worldwide". Rnw.nl. 15 April 2012. Archived from the original on 12 October 2014. Retrieved 2 May 2012. ^ a b c d "Guinea-Bissau" Archived 28 December 2010 at the Wayback Machine, CIA the World Factbook, Cia.gov. Retrieved 5 February 2012. ^ Guinea-Bissau Supreme Court Archived 23 January 2012 at the Wayback Machine. Stj.pt. Retrieved 22 June 2013. ^ Guinea-Bissau Political Parties Archived 9 May 2013 at the Wayback Machine. Nationsencyclopedia.com. Retrieved 22 June 2013. ^ Guinea-Bissau Climate Archived 9 May 2013 at the Wayback Machine. Nationsencyclopedia.com. Retrieved 22 June 2013. ^ World Bank profile Archived 11 November 2012 at the Wayback Machine. World Bank.org (31 May 2013). Retrieved 22 June 2013. ^ Guinea-Bissau and the IMF Archived 16 October 2012 at the Wayback Machine. Imf.org (13 May 2013). Retrieved 22 June 2013. ^ CFA Franc and Guinea-Bissau Archived 26 October 2012 at the Wayback Machine. Uemoa.int. Retrieved 22 June 2013. ^ Guinea-Bissau:A narco-state? Archived 29 October 2012 at the Wayback Machine. Time. (29 October 2009). Retrieved 22 June 2013. ^ Sullivan, Kevin (25 May 2008). "Route of Evil: How a tiny West African nation became a key smuggling hub for Colombian cocaine, and the price it is paying". The Washington Post. Archived from the original on 25 May 2017. Retrieved 27 August 2017. ^ "Guinea-Bissau drug trade 'rises since coup'". London: BBC News. 31 July 2012. Archived from the original on 27 October 2012. Retrieved 5 October 2012. ^ "OHADA.com • The business law portal in Africa". OHADA.com (in French). Paul Bayzelon. Archived from the original on 26 March 2009. Retrieved 10 January 2018. 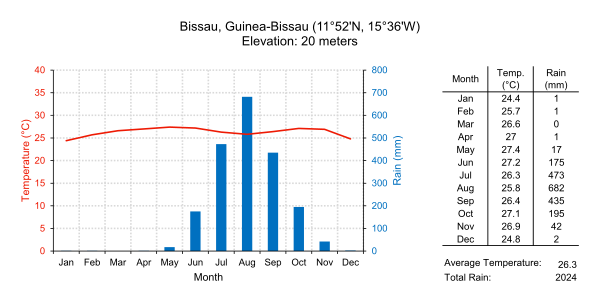 ^ a b "Population Division of the Department of Economic and Social Affairs of the United Nations Secretariat, World Population Prospects: The 2010 Revision". Esa.un.org. Archived from the original on 6 May 2011. Retrieved 20 January 2017. 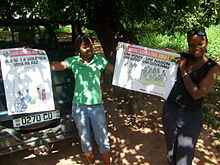 ^ Guinea-Bissau ethnic classifications Archived 17 October 2012 at the Wayback Machine, Joshuaproject.net. Retrieved 22 June 2013. ^ China-Guinea-Bissau Archived 11 October 2012 at the Wayback Machine. China.org.cn. Retrieved 22 June 2013. ^ "Guinea-Bissau: Regions, Cities & Urban Localities – Population Statistics in Maps and Charts". www.citypopulation.de. Archived from the original on 2 December 2017. Retrieved 1 December 2017. ^ a b c d e f g "Língua e Desenvolvimento: O caso da Guiné-Bissau José Barbosa – Universidade de Lisboa" (PDF). ul.pt. Archived (PDF) from the original on 9 August 2017. Retrieved 10 May 2017. ^ WELCOME TO THE INTERNATIONAL ORGANISATION OF LA FRANCOPHONIE'S OFFICIAL WEBSITE Archived 1 April 2014 at the Wayback Machine. Francophonie.org. Retrieved 22 June 2013. ^ a b "Tolerance and Tension: Islam and Christianity in Sub-Saharan Africa" (PDF). Pew Forum on Religious & Public life. April 2010. Archived from the original (PDF) on 30 April 2018. Retrieved 25 April 2018. ^ Guinea-Bissau: Society & Culture Complete Report an All-Inclusive Profile Combining All of Our Society and Culture Reports (2nd ed.). Petaluma: World Trade Press. 2010. p. 7. ISBN 1607804662. ^ "Field Listing :: Literacy". The World Factbook. Archived from the original on 24 November 2016. Retrieved 15 October 2014. ^ Lobeck, Katharina (21 May 2003) Manecas Costa Paraiso di Gumbe Review Archived 24 February 2018 at the Wayback Machine. BBC. Retrieved 22 June 2013. 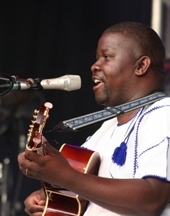 ^ Radio Africa: Guinea Bissau vinyl discography Archived 25 October 2012 at the Wayback Machine. Radioafrica.com.au. Retrieved 22 June 2013. ^ Music of Guinea-Bissau Archived 5 June 2013 at the Wayback Machine. Ccas11bijagos.pbworks.com. Retrieved 22 June 2013. ^ Mortu Nega Archived 18 December 2008 at the Wayback Machine. California Newsreel. Newsreel.org. Retrieved 22 June 2013. ^ Udju Azul di Yonta Archived 5 July 2009 at the Wayback Machine. California Newsreel. Newsreel.org. Retrieved 22 June 2013. ^ Flora Gomes The Two Faces of War: National Liberation in Guinea-Bissau Archived 8 February 2013 at the Wayback Machine. Watsoninstitute.org (25 October 2007). Retrieved 22 June 2013. 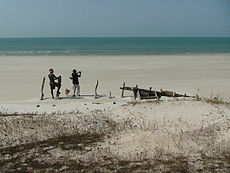 "Guinea-Bissau". The World Factbook. Central Intelligence Agency. 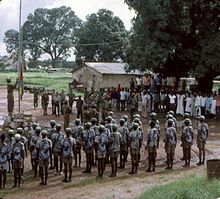 Parliamentary elections were held in Guinea-Bissau on 28 March 2004 after repeated postponements caused by political and financial chaos in the country, including a coup d'état that overthrew President Kumba Ialá in September 2003. The former ruling party, the African Party for the Independence of Guinea and Cape Verde (PAIGC), won the largest number of seats, but did not obtain a majority. Former President Yala's party, the Party for Social Renewal (PRS), came second with 35 seats. Kumba Ialá Embaló, also spelled Yalá, was a Bissau-Guinean politician who was president from 17 February 2000 until he was deposed in a bloodless military coup on 14 September 2003. He belonged to the Balanta ethnic group and was President of the Social Renewal Party (PRS). In 2008 he converted to Islam and took the name Mohamed Ialá Embaló. He was the founder of the Party for Social Renewal. In 2014, Ialá died from a cardiopulmonary arrest. Carlos Domingos Gomes Júnior is a Guinea-Bissauan politician who was Prime Minister of Guinea-Bissau from 10 May 2004 to 2 November 2005, and again from 25 December 2008 to 10 February 2012. He has been the President of the African Party for the Independence of Guinea and Cape Verde (PAIGC) since 2002 and is widely known as "Cadogo". He resigned as prime minister on 10 February 2012 to run in the presidential election triggered by President Malam Bacai Sanhá's death on 9 January. Elections in Guinea-Bissau take place within the framework of a multi-party democracy and a semi-presidential system. Both the President and the National People's Assembly are directly elected by voters. Presidential elections were held in Guinea-Bissau on 19 June 2005, with a second round runoff on 24 July. The elections marked the end of a transition to democratic rule after the previously elected government was overthrown in a September 2003 military coup led by General Veríssimo Correia Seabra. The result was a victory for former President and independent candidate João Bernardo Vieira. This name uses Portuguese naming customs. the first or maternal family name is Bacai and the second or paternal family name is Sanhá. Raimundo Pereira is a Guinea-Bissauan lawyer and politician who was interim President of Guinea-Bissau from 3 March 2009 to 8 September 2009 and again in 2012, following the departure of President Malam Bacai Sanhá for medical treatment abroad; he continued in that capacity after Sanha's death. Pereira was elected as President of the National People's Assembly on 22 December 2008. Pereira is a member of the African Party for the Independence of Guinea and Cape Verde (PAIGC). He was ousted in a coup on 12 April 2012 and succeeded by Mamadu Ture Kuruma. Presidential elections were held in Guinea-Bissau on 28 June 2009 following the assassination of President João Bernardo Vieira on 2 March 2009. As no candidate won a majority in the first round, a second round was held on 26 July 2009 between the two leading candidates, Malam Bacai Sanhá of the governing African Party for the Independence of Guinea and Cape Verde (PAIGC) and opposition leader Kumba Ialá. Sanhá won with a substantial majority in the second round, according to official results. On 12 April 2012, a coup d'état in Guinea-Bissau was staged by elements of the armed forces about two weeks before the second round of a presidential election between Carlos Gomes Júnior and Kumba Ialá. The coup started in the evening with military personnel and equipment making its way onto the streets, followed by the state-owned media being taken off-air.